by Dr. Joseph C. Pigg, D.C. The story is always the same. "Doc, I went to bed fine, but when I woke up I couldn't turn my head, I had to use my hands to lift my head up this morning, and I feel like I've been hit by a truck!" This is typical of a condition called "Torticollis". 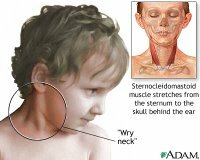 One type of torticollis is "Congenital Torticollis" that occurs in infants and young children. But we will be discussing "Adult or Acquired Torticollis". This occurs most often in the hot summer months when people go to sleep with their window open for air circulation. But then around 4am when the temperature drops the neck muscles stiffen and cramp and lead to a change in the neck reflexes that don't allow the tight muscles to loosen later. Whether you're over-tired or have had a little too much alcohol, sometimes people will get their head or neck into a position from which they don't move for several hours. The worst is when people sleep on their stomach and turn their head 90 degrees towards one direction so they can breathe, but also sleeping without a pillow or a shallow pillow can cause it. In the latter case, the neck is tilted too sharply towards the bed. For example, a person sleeping on their left with too shallow a pillow might have the joints on the left side of the neck jam or freeze in place while the muscles and other soft tissues on the right side of the neck are over-lengthened. It can also occur when one sleeps on their back on too many pillows causing their neck to be overly flexed during the night. Many times a person will report that they had done an activity outside of their normal routine the day before they woke up with the neck pain. Examples are people who are packing and moving homes, gardening, watching TV or a movie with their head turned one direction for the whole time, or beginning a new exercise in the gym. They don't usually feel any problem the day of, but wake up feeling it the next morning. 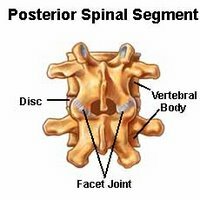 In this type of Torticollis, one or more of the small joints along the back side of the neck called "facet joints" become jammed or locked. The small supportive muscles of the neck that are usually controlled by unconscious reflexes (the muscles you don't even know you have until you have this condition) contract and hold the joint in a protective manner so as to avoid what it "thinks" is further damage to the joint. There is a swelling reaction around the joint as well. It is the swelling and the prolonged contraction that cause the pain. Here's the catch. The joint can't move normally because the muscles are holding their position, but the muscles won't loosen because they feel the joint out of position. Over the counter drugs such as ibuprofen or acetaminophen can temporarily help the pain and swelling. In severe prolonged cases, injections into the joint are sometimes used. However, most cases are self-limiting and do not require such drastic treatments. An average case of adult torticollis usually lasts from 4 to 7 days. Many people have to take a few days off work because they can't drive or because the pain is too severe while working. X-rays are sometimes taken, but in typical non-serious cases, x-rays do not show the cause of the torticollis. Physical therapy employs a technique called Neuromuscular re-education in which proprioceptive neurofacilitation (P.N.F.) is used. After a therapist performs passive range of motion (ROM) in the pain-free range, they then use these longer named techniques which basically involve gentle isometric contraction into or away from the side of pain. The treatment reproduces the pain because it in effect "re-sets" the normal muscle reflexes much in the way that a computer can be "re-booted" when something goes wrong. Other helpful modalities may involve ice, heat, ultrasound, electric muscle stim., and traction. All of the above helps address the muscular reflex and spasm part of the condition, however the deeper joint issue should also be addressed. A chiropractor can help with this, however, it is very difficult to receive an adjustment (even if you're already used to getting adjusted by a chiropractor on normal days) unless the physiotherapy involving resetting of the muscle reflexes and range of motion is done first. Otherwise, the tendency of the muscles will be to fight the adjustment. In my own practice, I spend the majority of the time first performing these physiotherapies and then preposition the head in several different positions to see which would be the most comfortable for an adjustment. If there is no position possible without sharp pain, then I either use a light force adjusting tool (Activator) or don't adjust the person at all at that time. When a patient is able to handle an adjustment, there is usually a sharp pain followed by instant relief and a relaxed feeling in the muscles. However, the muscles usually try to follow their newly learned habit and retighten over a few hours, but to a lesser degree. It is not uncommon for someone with this condition to come in for treatment in the morning, and then return for a follow up the same day in the evening. Typically after 3-4 treatments, the joint moves well enough to allow the muscles to calm down on their own and the person is able to function more normally. Without treatment, torticollis usually will resolve on it's own in 5-7 days. With proper conservative treatment, the majority of the condition usually resolves in 2-3 days. There is commonly left over soreness for about 1 week, but 90% of the motion with no sharp pain. It is crucial not to repeat sleeping in the wrong position again during this recovery phase.